Installation and wiring of an electrically operated door must be performed by a local security company, locksmith or electrician of your choice. The following information explains how to connect the door controller to send a signal to the door circuit when a person checks in. The Network Door Controller attaches to the router on your network and to your electrically operated interior door. When a person completes the check-in process, the door circuit receives a signal to buzz the door open. 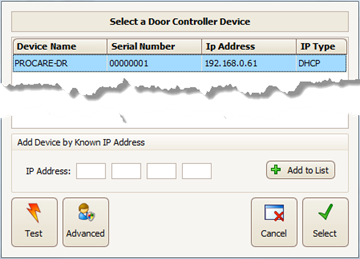 Note 1: The Door Controller is an IPV4 device supporting APIPA, DHCP, and static IP addressing. Note 2: If connecting to your router is not feasible, see: Connect to Computer for an alternative. A parent or other authorized pickup person checks children in at a check-in computer. You MUST install the Procare “client” software on your check-in computer first, because you’ll need the Procare Check-In program running to set the options needed for the Door Controller. A staff person uses the Receptionist feature to check children in on behalf of the pickup person. In this case, a check-in computer is not necessary. Settings for the Door Controller are accessed from your Procare Home screen. The Door Controller is designed as a switch for controlling an electrically operated door strike (not supplied). Attach one wire from the Door Strike circuit to the Common (C) terminal (diagram “A”, below). For an electric door strike: Connect to the Normally Open (NO) terminal (as shown in diagram “A”). For a magnetic lock: Connect to the Normally Closed (NC) terminal. (Note: Diagram “A” shows a “NO” connection. Change to a “NC” connection for a mag. lock). Note: A manual by-pass is strongly recommended so a staff person may open the door as needed. The red power indicator light should come on (side of Door Controller). See Indicator Lights (above). A flashing green light indicates it is not yet connected to the network, which is normal at this point. Note: You’ll need a separate power supply for your electrically operated door. Connect the other end of the Door Controller to an open port on your network router using the network cable (included) or your own CAT5 / RJ-45 network cable (diagram “B” below). At the Check In computer, dbl-click the Procare Check In shortcut on your desktop. 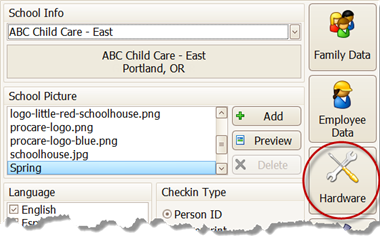 Dbl-click in the gray border area around the logo (or press Esc on your keyboard) and then click Options. Click the Hardware button (right side). Choose Network as the type of door controller and click Select. Locate the Door Controller or manually add it to the list (see image below). 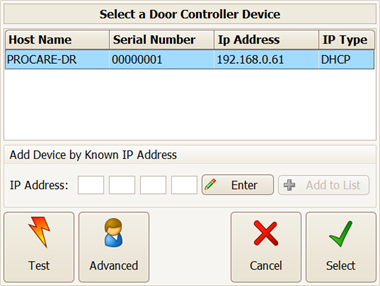 If you have just one door controller, it should be found automatically. If you have more than one, choose the one this computer will use. If you have: multiple routers, multiple door controllers, or use fixed IP addresses, see Door Controller Advanced Install. Test and select the device. With the proper Door Controller highlighted on screen, click Test to send a signal to the controller. The green light on the side of the controller should come on for just a moment. Click Select to choose this device and return to the Hardware screen. Set the Delay (time to wait before the door opens) and Duration (time you’d like the door to stay open). Click the Test button to confirm the door opens. 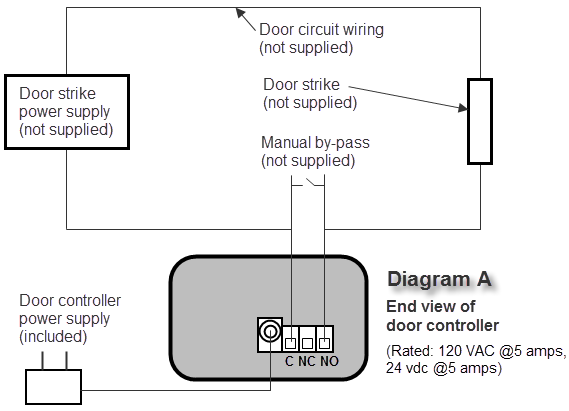 Your door circuit must be attached to the Door Controller and both the door strike and controller unit must have power. Check the box next to Authorized Pick Up and/or Employee if you wish to require a person to check in/out in order to open the door. Close out of the hardware and check-in settings. 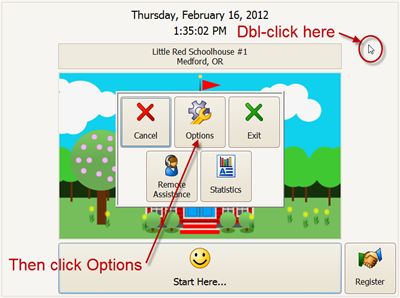 Choose Exit to leave the Hardware screen and Exit again at the Check-In Options (School Info) screen. To close the main check-in screen, dbl-click in the gray border area around the logo (or press Esc on your keyboard) and then click Exit. Optional: A front desk person uses the Receptionist method to check children in on behalf of the pickup person. Log into Procare as usual and from the Procare Home screen go to Configuration > Machine. 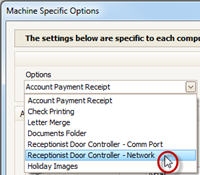 From the Options drop-down list, select Receptionist Door Controller – Network. Uncheck “Not Using a Door Controller” and then click Choose a Device. Locate the Door Controller or manually add it to the list. If it is not found, manually type the IP address and choose Add to List. Optional: The Advanced button should only be used to change the name or set a static IP address for the selected device. If you have more than one door controller, changing the name may be helpful to identify the location, such as “FRONT DR”, “BACK DR”, etc. Click Select to choose this device and return to the Machine Specific Options screen. Set the Duration (time you’d like the door to stay open). From the main screen of Family Data & Accounting go to Functions > Attendance Tracker > Receptionist. An Open Door button (bottom center) allows a staff person to buzz the door. Learn how to Check People In and Out. Can the Network Door Controller be used by 2 Computers at One Time? May I allow people to buzz the door open without checking in?